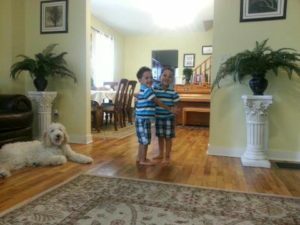 The 4-year-old Bakri twins are running through the house, their socks sliding across the smooth hardwood floors. It’s life as usual in the Bakri house on Page Street NE, and the boys’ parents, Damian and Sarah, love it. 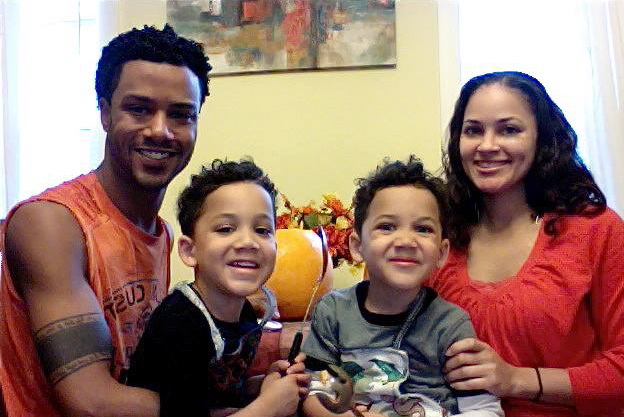 This lively family of four moved into their pretty house in 2014, after nine years of renting. “We realized that renting was like throwing money down the drain,” says Damian, who works in manufacturing at Lacks Enterprises. So they started house hunting. Then, after nearly a year of searching, he spied a great house online, for sale by New Development Corp. The price was right. Although it was built in 1902, everything had been remodeled and updated. It was practically new. It’s just a mile from the home of Sarah’s mom, who could walk over to visit. It was perfect. New Development referred the couple to first-time homebuyer classes, which prepped them for the whole process. They installed wood fencing around the yard so the boys and their two Standard poodles, Luna and Crixus, can safely play. They added a stone patio where they grill, year round. If you smell something delicious, it’s probably one of Damian’s Middle Eastern specialties — maybe ground meat and cracked wheat patties with fragrant spices, called kibbeh. Sarah, who works in direct care at Hope Network, tells how the sturdy home is perfect for rousing games of hide and seek. Israel peeks from behind a big potted fern, to demonstrate. Dining room chairs turn into forts, where adventure happens. Damian plays Mozart and Beethoven on his violin or on the gleaming piano, which snugs up just right by the staircase to the second floor. She loves how cheerful daffodils sprout out front every spring, and how neighbors help each other shovel snow in the winter. “The neighborhood’s coming up pretty well,” she says. “It gets pretty loud here,” Damian says as the twins chatter, “with the boys and two dogs stampeding around the house.” He laughs.